Shortly after I qualified back in 2011 I had my first baby. Here I was, fresh after my course, raring to go with my reflexology, but with a tiny baby! I had had these wonderful ideas of supporting clients while my baby slept peacefully upstairs… Little did I know about those first few months of motherhood! What I did have time for, though, was reflection. I spent those first few months, during the long feeds and frequent nappy changes, mulling over names for my therapy business. I wanted something that captured who I am and what my business would be about – no mean feat! 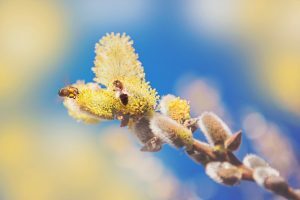 I kept returning to the affinity I have with bees; my name, Deborah, means bee in Hebrew and one of my earliest memories is trying to nurse a bee back to health as a child. I love the time of year the bees reappear suddenly as if by magic, signalling the shift in the seasons as the flowers begin to blossom. Pollen Therapies also reflects my love of nature. Our move to Bristol in 2016 was in large part to have greater access to the outdoors – having beaches, rolling hills, mountains and rugged coastline within easy reach is truly special. We have “outdoor kids”; our eldest will attempt to climb every tree he comes across and is happiest running through everlasting fields, and our youngest will sit happily in a muddy puddle with slugs, snails and woodlice for company. Being in connection with nature, using its wisdom and its gifts to support better wellbeing is fundamental to the work I do. Mindful walks in nature is one of the best medicines we can support ourselves with and it is one of the most common pieces of advice I give to my clients. Having just a few minutes every day outdoors, away from technology, feeling in the present, can have a great impact on our overall wellbeing. Blending all these ideas together brought me to the name ‘Pollen Therapies’. It always reminds me of what brought me to the work in the first place and what drives me to continue supporting clients. If you’d like to find out about how reflexology and my other therapies can support you, please do get in touch.